For fans, the popularity of Taylor Swift’s recent Netflix tour movie was no surprise. For them, it was a great way to relive the concert all over again! But for many, this may have been the first time they had a chance to see the phenomenal performer Taylor Swift truly is. As a concert goer, it’s easy to miss many of the details that go into a show, particularly during a complete stadium tour. This movie encompasses everything one may not have seen by sitting in the nosebleeds of Gillette Stadium. From start to finish, this movie shows the full final performance of the US leg of the Reputation Tour. And from start to finish, the movie shows the energy, passion, details and theatrics that Swift brings to her shows. The enormity of this of the stage and set design is almost beyond comprehension. The idea of one person commanding and selling out a complete stadium tour is hard to imagine. Yes, that is a giant snake rising for center stage... her name is Karyn. Taylor had a total of three stages, two of which were placed in the back of the stadium. She traveled to all three by floating and singing on a miniature snake skeleton. She tends to stay on brand. The two hour performance features completely new renditions to almost all of her songs, making the ones you’ve heard on repeat sound completely brand new. One thing Taylor has been known for is mashing up her old songs with the new. Such as Bad Blood/Should’ve Said No and Long Live/New Year’s Day. The movie shows Taylor as talented performer that her fans have always known her to be. It is hard to deny the talent, care, and drive that goes into a performance like this. Each set challenged her vocals and displayed her vocal range many don’t believe she has. 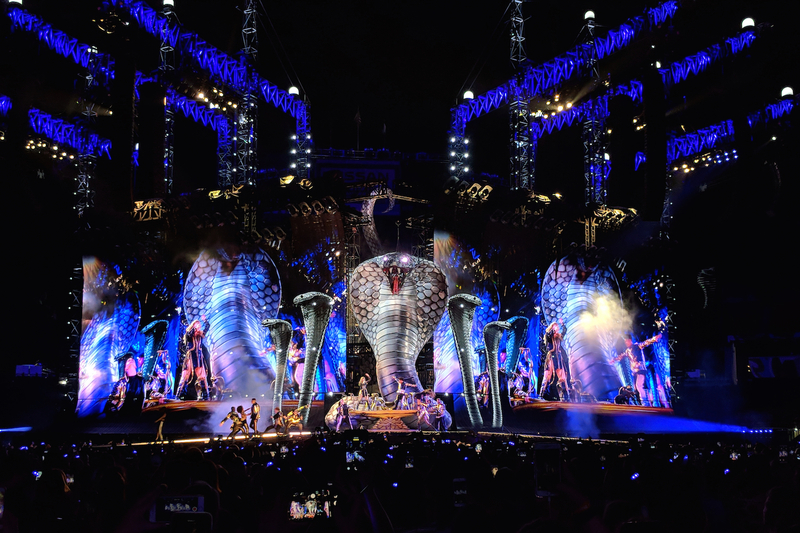 Last but not least, Taylor Swift’s Reputation Stadium Tour Movie proves that despite her reputation, Taylor Swift is not going anywhere. Bring on TS 7. Hannah is senior at Emmanuel College majoring in communications and media studies as well as a minor in psychology. Her favorite things to do are petting dogs, traveling, taking pictures of food and binge watching Netflix. She currently serves at the Co Social Media Director of Her Campus at Emmanuel.